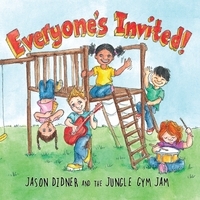 Jason and Amy Didner got their inspiration to write this album's lyrics together last winter from their then-one-year-old daughter. Jason is the host of "The Cool Rockin' Daddy Video Show" on Montclair, NJ's TV-34 channel and streaming live at coolrockindaddy.tv. Amy interviews popular children's musicians on the show. Songs on "Everyone's Invited!" offer learning for kids at multiple levels, often within the same song. - "Five Sea Lions" teaches older kids (and grown-ups) the difference between sea lions and seals. - It teaches younger kids to count down from five! - Ramones-style punk energy on "Jungle Gym Jamming" and "Down By the Bay." - Grateful Dead/Phish type jamband grooves on "My Glasses" and "The Pick Song," driven by the tight rhythm section of Ross Kantor on drums and Judy Helbig on bass guitar. - Rootsy folk on "Mimi the Ladybug," featuring a mandolin acting out the part of the ladybug and her dancing feet. Produced, engineered and mixed by Dave Cushing at Snowdome Studios, Montclair, NJ, a converted carriage house with a history back to the days of horse-drawn buggies. Mastered by Scott Anthony at The Viewing Room in Springfield and Maplewood, NJ. John Ginty set aside time after a tour of Canada as the Dixie Chicks' organist to fire up his 1969 Hammond B-3 organ and add his soulful sound to "Window of the Train" before flying to Los Angeles to record organ tracks for Steve Earle. Amazing CD for kids...and their parents! We loved the message inherit in each of the songs: kindness, friendship, learning and most importantly for young ones…imagination. The songs are upbeat, fast paced and immediately bring to mind pictures of animals and inanimate objects having a great time. Loved the counting songs; must have for those trips in the car!